Finding the right laptop computer bag should be easy as the variety of laptop bags on offer is astounding. There are leather laptop cases, computer backpacks, rolling laptop cases, designer laptop bags, laptop covers, funky laptop bags... the choice is yours. Having too many choices can though be confusing. How do know what is the best computer bag for you? This article helps you to find the best laptop case for you and your needs. What Do You Want From Your Laptop Case? This is the first question you need to answer. The answer will tell you which computer bag features are most important to you. Let's look at few examples. Are you looking for an everyday computer bag for work or school? Then you are likely to be looking for something durable and practical. For durability look for quality material and sturdy features, like zippers, straps, handles, wheels, etc. For practicality, consider carefully the practical features that matter most to you, like the internal organization, how to easy / comfortable to carry or wheel the bag, etc. Are you looking for something when taking your laptop out and about town? Then the look and design might be more important to you than durability and practicality. The best laptop bags reflect our personality and style. It does not matter if you are the casual urban type or stylish fashionista. There are laptop bags available that fit your image. Or are you looking for something to protect your laptop and other valuable equipments while travelling, e.g. on business trips? Then practical issues include good internal padding but also enough space for everything you need on your trip, e.g. equipments, working papers, even change of clothing. The bottom line is... know what you want from your laptop computer bag and you will find the best laptop case for you and your needs. Which computer bag features matter most to you will depend on what you want from your laptop computer bag. In most cases, you will have some choice between the following features. Being able to wheel your laptop bag around can be very beneficial, especially if travelling or commuting frequently with heavy items, like books or papers. Wheeled laptop bags are understandably very popular among business travelers. Rolling computer cases are though not just for business travelers. You can get rolling laptop backpacks, which give you the option of carrying or wheeling your bag. 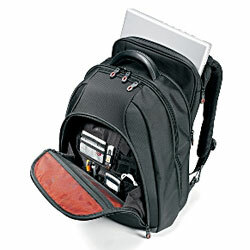 This makes wheeled computer backpacks popular among students and casual / leisure travelers. Then there are wheeled laptop bags aimed towards women. Laptop bags for women tend to be more "feminine" and stylish looking, e.g. in more colors and pattern than solid black or brown. The wheeling system however adds to the weight of the bag and takes up some of the valuable space. Therefore, if you are not travelling or commuting frequently with heavy items, then non-wheeled computer bag could be better option for you. There are wide range of stylish laptop totes and handbags for women available now a day, i.e. where you can safely fit in a small laptop or tablet. While laptop messenger bags and backpacks are popular by both sexes, as well as laptop briefcases. Then there are laptop covers and sleeves. They are great to protect your laptop, e.g. within another bag. Laptop covers can though be suitable on their own, e.g. when travelling by car and taking your laptop along. What Size Of Laptop Bag Should You Go For? 17 inch laptop case is the most common size but you can both smaller and bigger computer bags. It is recommended to measure your laptop bag for the right fit. The internal organization of the laptop computer bag is always important. Your laptop must be adequately protected in the bag, i.e. from both damage and theft. Special locked and padded compartment for your computer is therefore ideal. Most computer bags offer separate compartment for the laptop and separate compartments for other items. The internal organization can cater for different needs, i.e. some appeal more to business travelers, others to students, and still others to leisure travelers. External organization can also be important for you. Many laptop computer bags have external pockets for easy access to travel documents and other necessities, e.g. cell phones, magazines, etc. Internal and external laptop bag organization may include laptop compartment, fully lined interior, flap pockets with locking closures, file divider compartments, removable pouches, shoe pockets, media pocket, zip pocket, mesh pocket, open pocket, pen loops, back zip pocket, add-a-bag sleeve, accessory pouch, phone pocket, key ring, etc. There is no one best laptop case material. Each Luggage Material has its pros and cons. Factors to consider include durability and ease of cleaning. Leather is classic luggage material, as it is durable and stylish. Good quality leather is however quite expensive and somewhat limiting in design. Modern technology means fabric that is more durable and with more options, e.g. in style and colors. The more durable the material is, the more you can expect to pay for it (though the material is far from the only thing that affects the bag price). Other features that may be of value for you include being able to attach your laptop bag to another bag, e.g. wheeled carry-on or suitcase, adjustable and removable shoulder strap, and inbuilt lock and luggage tag.